It is in the eastern states of Bengal, Odisha, Bihar, Manipur, Tripura and Assam that people celebrate it only on four days of Navratri as Durga Puja. 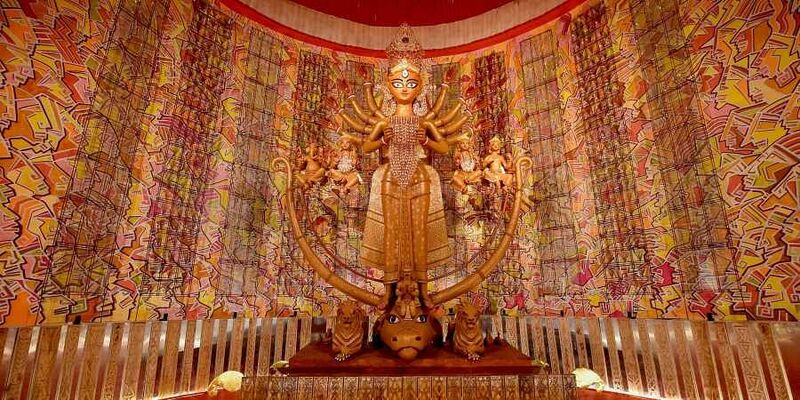 HYDERABAD: It’s that festive time of the year when Durga Puja, the biggest annual festival of the Bengalis, will be observed with much gaiety and fanfare. Elsewhere in India, too, the goddess is worshipped during this period where it is known in several other names such as Navratri especially in the north, Dasara in the South. The Bengali diaspora has gripped all the Hyderabadis with the Durga Puja celebrations. And Hyderabad Bengali Samity or HBS, the oldest Bengali socio-cultural organisation in Hyderabad, is celebrating its 77th year Durga Puja at PVR Convention, Lower Tank Bund between October 15 to 19. HBS observes all the rituals of the Puja to the minutest detail which would be performed by scholars and priests from Kolkata. Puja days are strictly observed according to the Hindu calendar and prayers are offered on the four main days. Bhog is offered to the Goddess and the prasadam distributed among all the devotees on Saptami, Ashtami and Navami days as annadanam. In the evening there are cultural programmes where famous artistes from Mumbai and Kolkata will perform melodious numbers. Apart from this, the local talents will also enthrall the crowed with different cultural presentations like dance, music and different kinds of plays. The celebrations come to an end on Vijayadashami with women in white sarees with red border, bidding farewell to the Mother Goddess by offering her sweets and applying vermilion in the partition of their hair.